In much of my writing, I tend to emphasize the differences between our modern worldview and those of the pre-Christian Europeans. As real and weighty as those differences are, however, I’d be the first to acknowledge that there’s also a considerable degree of continuity between how we perceive the world today and how the Bronze Age and Iron Age Europeans did. 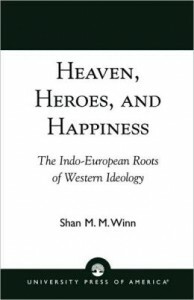 This continuity is the central concern of Shan Winn’s Heaven, Heroes, and Happiness: The Indo-European Roots of Western Ideology. The Proto-Indo-Europeans were a people or group of peoples who probably originated in the Pontic-Caspian steppe (covering parts of what are currently Ukraine, Russia, and Kazakhstan) during the Bronze Age. They were nomadic or semi-nomadic pastoralists who were one of the first peoples to use domesticated horses and wheeled carts. During the Bronze Age, they settled in and profoundly shaped many of the societies of Eurasia, including virtually the entirety of Europe. The Celts, Slavs, Greeks, Romans, Germanics, and others were all Indo-European societies, derived in large part from the same Bronze Age, Proto-Indo-European model. Almost all modern European languages (with a few exceptions like Basque and Finnish) are part of the Indo-European language family descended from the original Proto-Indo-European language. As Winn shows, the Indo-Europeans gave us far more than just the languages we speak. For example, all Indo-European societies had a tripartite hierarchical structure. In the first and most powerful tier were the rulers and priests, in the second the warriors, and in the third the commoners – farmers, merchants, craftspeople, etc. Of all of the countless possible forms that the structure of a human society can take, this specific one, which may seem banally obvious to many people, is almost uniquely Indo-European. The cosmology that underpinned it, wherein the divine realm is ordered according to this tripartite structure, and the roles and interactions of the gods and goddesses are closely tied to their position in this structure, and where the number three shows up as frequently as the number seven in the ancient Middle East or the number four in many American Indian groups, is certainly uniquely Indo-European, and is remarkably uniform across its various manifestations. While modern Western societies don’t follow this structure as strictly as they did in the past, it’s still the primary reference point around which our societies are ordered. To cite another example, Zarathustra, the Iranian prophet of the second millenium BCE whose teachings would go on to exert a profound influence on later monotheistic religions, perhaps especially Christianity, was himself a priest of an Indo-European society. 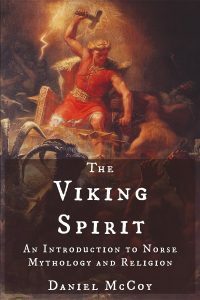 His mythology and philosophy were in many ways radical departures from those of his ancestors, but he nevertheless used many existing Indo-European mythical themes as raw materials. Winn’s work draws especially heavily on the works of two of the most respected and influential scholars in the field of Indo-European studies, Georges Dumézil and Marija Gimbutas. While I can readily accept the soundness of Dumézil’s ideas (he was the first to point out and analyze the remarkable centrality of tripartism in Indo-European social structures and mythologies), I can’t always say the same of Gimbutas’s. For Gimbutas, the peoples of pre-Indo-European Europe were uniformly peaceful, egalitarian, harmonious, Great Goddess-worshipping, matriarchal agrarians who nevertheless developed highly complex societies and placed a very high value on art. When the big, bad Indo-Europeans arrived, they mercilessly conquered and subjugated these peoples and erased their way of life. While I think there’s something to be said for the idea that the peoples who inhabited Europe before the arrival of the Indo-Europeans lived in a manner that’s closer to that imagined way of life than did the Indo-Europeans, Gimbutas greatly overstates her case, creating a stark dichotomy and casting the peoples of “Old Europe” in a light that played directly into the unrealized hopes and dreams of mid-to-late-twentieth-century liberalism/progressivism, giving people of such a persuasion a supposedly historical utopian model to look back (and therefore, of course, forward) to. 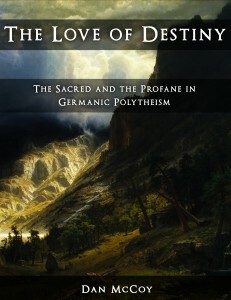 Winn mostly accepts Gimbutas’s work uncritically, and has an annoying habit of assuming that Indo-European goddesses could only be holdovers from Gimbutas’s Old Europe, as if the Indo-Europeans were so completely, cartoonishly patriarchal that they couldn’t have had any original goddesses of their own. However, Winn does make one passing reference to the obvious, almost Zoroastrian dualism inherent in Gimbutas’s vision. Ultimately, Heaven, Heroes, and Happiness is an excellent introduction to Indo-European society and mythology, and a fascinating study of the ways in which aspects of their worldviews and ways of life have survived down to the present day. Recommended. Click here to view or buy Heaven, Heroes, and Happiness at Amazon.com.